Now that we've gotten that out of the way, I thought I'd share with you guys some of my personal, and very random, thoughts about the trailer for a movie we have to wait an entire year to see. Read more after the jump! The meat of what I want to talk about is actually the second to last scene, so I'll break the trailer down scene-by-scene with my thoughts for each. The first thing we see after a fade-in to a bunch of sand is new cast member, John Boyega. Here, he's dressed in stormtrooper armor and looks sweaty and freaked out. Based on some of the other imagery in the trailer, I think it's safe to assume he's being chased. The only real complaint I've got here is that it's an odd, J.J.-like shot, and doesn't really feel like something that belongs in a Star Wars movie. Not bad, just odd and different. This is where I start being like, "Wait... what?" I know that we heard previously that there would be stormtroopers in the film, but even then it seemed odd from a story perspective. What I want to know is: how is it that the Empire is still around 30 years after Return of the Jedi? Maybe it's an Outer-rim faction that still exists or something? I'm sure there's a good explanation, it's just something that I really don't understand yet. I figured the rebellion - now armed with the morale boost from destroying the Death Star II - would have snuffed the rest of them out and started up a New Republic. That's something the Expanded Universe dealt with and, even though I think 98% of the EU is junk, it seemed like the natural progression from RotJ. As far as the shot itself, I'm not really a fan of the lighting inside the drop ship/shuttle/whatever it is. That's super nitpicky, though. Not a whole lot to say here except for... POD RACERS IN THE BACKGROUND!! Nice callback to the prequels there. IGN, in their Rewind Theater video, claimed to see what looked like a lightsaber hilt attached to her bike. Looks like it to me, too. Interesting. This and the last scene are the most Star Wars-like in the entire trailer. Like with the stormtrooper clip, I was also confused with this one. So the Rebel Alliance is also still around? They could just be New Republic X-Wings, but there's no way to tell for sure. We'll go back to this one in a minute. The Falcon... with TIE Fighters! This is the part of the trailer that made my heart swell up and almost get a little misty-eyed. Seeing the Millennium Falcon dog-fighting TIEs in the desert (I'd be surprised if it weren't Tattooine), set to the Star Wars main theme, pretty much sealed the deal for me. I'm pretty sure that was the purpose of putting this shot in the trailer, and it did its job well. TIE Fighters, though? That goes back to my "does the Empire still exist" question. Like I said, this is the meat of the article - the part that will probably go on for many words. Also, beware of its disjointed nature. I'm going to be speculating as I write. A friend of mine, in response to a link I posted on Facebook of the trailer, said that he would be disappointed if this was a Sith character, as they were supposedly snuffed out in RotJ. That was what the prophecy was all about, right? Obi-Wan did say to an on-fire Anakin, "You were supposed to destroy the Sith, not join them.” Keyword: destroy. Personally, I agree with my friend: I'll be disappointed if this guy is a Sith. If he is, that makes the first six movies pretty pointless in terms of an overarching story. But what if he's not a Sith at all? Through the Clone Wars TV show, we've seen that users of the Dark Side of the Force don't necessarily have to be Sith. Characters like Asajj Ventress and the Night Sisters are proof of this. Most recently, in Rebels, we've seen another Dark Side user in The Inquisitor. So if that's the case, what does it mean to be a Sith? I think the problem lies in the fact that we don't really know a whole lot about them from the films and the two TV series. We've only seen a total of five Sith - Darths Maul, Tyranus, Vader, Bane (in ghost form), and Sidious. We know the existence of at least one more, Darth Plagueis, so that's six Sith (try to say that five times fast!) we know of that exist in the official cannon. However, we've only seen one character actually become a Sith: Darth Vader. For his "knighting," Anakin Skywalker was made to say that he gave himself to Palpatine and had to listen to the Emperor's creepy, demonic voice as he was given the Vader moniker. This is all we know of the process. As for other facts related to the Sith, we know that 1) they hailed from a planet called Morriban (The Clone Wars) and 2) there can only be two at a time (Episode I). That's it. Two things. So if Anakin destroyed the Sith, brought balance to the force, and brought peace to the galaxy, who the crap is the guy in the trailer with the broadsword-ish, red lightsaber? We also know from the Rebels TV show that kids are still being born with Force sensitivity, and that the Order 66 Jedi Purge couldn't stop that. Maybe the new guy was one of those kids. There's only one problem with that, though: who taught him to use the Dark Side? With the Jedi, there was a whole culture and religion based around the Light Side. Knights would take apprentices who would eventually become Jedi Knights themselves to teach more apprentices, and the cycle would continue, all culminating with Knights becoming Masters. On the Dark Side of things, a master would take an apprentice, that apprentice would kill the master (becoming, himself, the master) and would take his/her own apprentice. Characters who were Dark Side users had (as far as we know, based on established cannon) been taught to use the Dark Side by one of the two Sith at the time. What I'm getting at here is that there seems to always have to be someone who can teach a Force-sensitive how to use the Force, whether it's for good or bad. It is assumed that anyone who - post-RotJ - was going to learn the Force in any kind of way, would have to learn it from Luke and anyone he taught. The Dark Side would no longer have anyone to teach its ways. What if the Dark Side-guy was a former student of Luke's during the thirty years between Episodes VI and VII? To me, this is the only thing that really makes any sense whatsoever. At this point, it would seem that the only logical thing would be to have someone who knows how to use the Force simply "turn evil," as there's only one guy out there to teach it, and he's a Light Side user. So again, who is this guy in the trailer? I have no idea, but I hope that whoever he is, the reason for his existence absolutely blows my mind. I want to have one of those "ooooooohhhhhhh, ok!!!" kind of moments when I find out during the new trilogy. I definitely don't want to have a "well that's lame" moment. In conclusion, I like the trailer. I'm still not blown away, nor am I as excited as I should be that there is a brand new Star Wars movie coming out next year, but I'm reasonably excited. Hopefully, as new plot information is revealed, I'll start getting more excited. As of right now, I'm (as well as the rest of the internet) speculating on roughly two minutes of cut-together footage where there's not a whole lot to go on. None of us knows anything yet, other than the basic look of the film. As for that, I'm ok with it. There are some odd camera moves and lighting for a Star Wars film in some shots of the trailer, but I enjoyed it overall. Plus, the mystery of what all this stuff is makes the time leading up to the film that much more enjoyable, though quite scary at the same timea. We'll see how the finished product is in December! Posted on December 6, 2014 by Josh Shaw and tagged Episode VII Star Wars The Force Awakens opinion speculation trailer. !!! Tell Me Doctor, Where Are We Going This Time? (Bruce Willis is Marty McFly) !!! Looper, I Don't Even Know Her!?! Time travel is a tricky concept to grasp. There are scientists that have theorized about the possibility of moving through space and time for many years. From Einstein to Carl Sagen all the way through to Stephen Hawking, some of the most respected men in the field of science have discussed the likelihood of actually traveling forward or backward in time. We may never see science and technology catch up to the theories, but that hasn't stopped Hollywood from mining time travel as a heavily used plot device. James Cameron used it to bring robots from the future back to kill the leader (and his mother) of the resistance opposing said robots. Robert Zemeckis sent Marty McFly back to 1955, then forward to the future, then back to the old west (I still don't know how they keep that movie series straight). Doctor Who does it consistently week in week out on TV. Everywhere you turn someone on some show or movie is traveling to and fro through the Time Stream (yes, I love DC comics and their crazy time and space hopping). Apparently, Hollywood is not through sending people hurtling through the time vortex. Check out the trailer for the new Bruce Willis, Joseph Gordon-Levitt starring action movie called "Looper". This is one seriously crazy concept they got going on here. The story goes that, in the future, time travel is possible, but, because of the unpredictability of the act of time hopping, it has been outlawed. It is only available on the black market and used by criminals and the like. The mob has found that if they want someone dead they send them back in time to a hit man, who gets paid for the act. This is an effective way to avoid the unpleasant and potentially incriminating disposal of a body. Who's going to look in the past for a guy that's missing in the future? Pretty Smart, Huh. Well Gordon-Levitt is the hit man tasked with killing these people and one day they send someone that he didn't expect. They send the older version of Joey's character (played by Bruce Willis) back in time so he can kill himself. Let's forget about creating a time paradox and just check out the awesomeness that takes place in this trailer. Plus, it's got Bruce Willis, and I know some people (mostly a certain woman) who will drool their heads off at seeing this 57 year old man push his walker around a movie screen for a couple of hours. Well, take a gander and let us know what you think. I'll Be Back!!! Posted on July 1, 2012 by Todd Blanchard and tagged Back to the Future Bruce Willis Dr Who Joseph Gordon-Levitt Looper Terminator Time Travel movie movies trailer. I knew this was being made, but I had no idea it was anywhere close to having a trailer. This is gonna be a great time at the cinema, folks... AGAIN! Posted on June 22, 2012 by Josh Shaw and tagged film gin gon international movies qui trailer. !!! Dr. McCoy, Cursed Earth Pizza (Judge Dredd Is Now Just Dredd) !!! Bones, Are You Really The "Law"?!? So, here we are a day later and to no one's surprise Lionsgate has released the "Full" trailer for their reboot of Judge Dredd, now simply know as Dredd. Was that so hard? Did I really have to go on a rant yesterday about the "teaser for a trailer" thing? I don't think so, Lionsgate. Guess what guys, your not even in the big leagues yet. Disney, Paramount, Warner Bros., Sony, Universal, and 20th Century Fox are your major leaguers, at best you guys are triple A ball. So, you need to dismount the pretentious horse and just release the gosh darn trailers already. Ok, I am done with the ranting and we are moving on. We are moving, we are moving, we are moving, and we are stopping. Now, I am really excited about this Judge Dredd (Dredd for short). I'm a fan of the Stallone version (yeah, not the popular opinion) and I am also a fan of the Judge. You put Karl Urban in it, as Judge Dredd no less, and I'm pretty much in a seat opening weekend. Urban is fantastic as Dr. McCoy in the new Star Trek movies and I've been a fan since LOTR where he played Eomer. Not all of the movies he's been in have been good, but he is good in everything he's in. Those New Zealanders are born with it. This also looks like a more gritty take than the first one. I know, I know, I've been slamming the dark and edgy route for a week now. This, however, is a different situation. Stallone's take had both moments of grittiness and moments of humor. Judge Dredd in the comics was always a dark character and putting him deeper into that world does not fundamentally change the character. It possibly could be the exclusion of Rob Schneider that changes the tone (no, really?) or it could just be a more serious adult take on the material, it still doesn't matter. 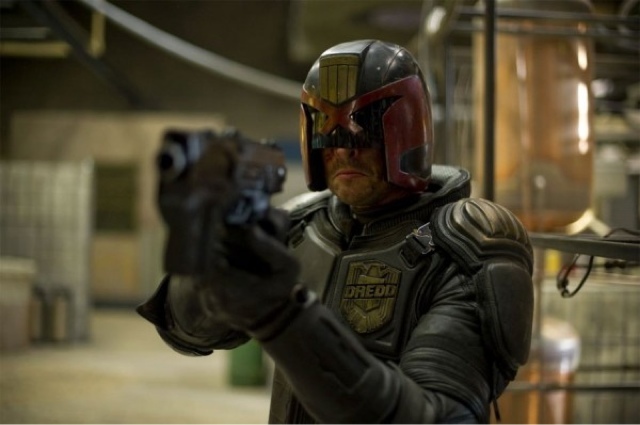 Dredd is a policeman who has the ability to convict and punish (think execute) criminals on the spot, that's heavy as it is. This looks very interesting and it has me ready to see it. Well, I guess I wasn't done ranting after all, how bout that (not surprised)? There's more news out there (thank God), so I'll be back with more news and rumors. Stay seated with your hands and arms inside the blog at all times, and, please, no flash photography. Yep, he is "The Law"!!! Posted on June 21, 2012 by Todd Blanchard and tagged Judge Dredd Karl Urban Lionsgate Rob Schneider Stallone dr mccoy movie trailer.